All A Bunch Of Momsense: Now for some Friday Fun! Now for some Friday Fun! I'm going to combine these two blog hops, I think, in consideration of space & time (or the time-space continuum, or something!) Plus, they are similar, and both really awesome, and I want you guys to hop through BOTH of them! HA! 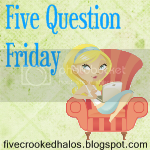 So, welcome to Mama M's Five Question Friday/The (Un)Experienced Mom's Fill In The Blank Friday Super Hop! Check out both McLinky's below to find out what everyone else's answers are! I'd love to be on the radio! I think it'd be fun to talk to people about stuff. Maybe even a play on my real job - I could to a radio tax show. Just one SONG!? Wow. I could probably listen to the Goo Goo Dolls "Iris" over and over again, or Chris Tomlin's "Made to Worship" or "How Can I Keep From Singing" Can't pick just one. Sorry! Yes! I am a glutton of all communication. I email a LOT, though, because my schedule pulls me all over the place, and I can revisit an email to make sure I'm answering the questions I need to. I'm also a big fan of the IM. My Bare Minerals foundation. I have less than fantastic skin, and I can wear no other makeup and feel totally pulled together. Since I'm not a big makeup person, I love that it's easy to throw on and doesn't feel foul! That's another tough one. I grew up in the Michael Jackson era. I love his ones with social meaning. "Black or White" comes to mind, for example. But who doesn't love "Beat It" or "Billie Jean"!? Now to Fill in the Blank! Yikes, really!? I dunno, Meg Ryan is pretty spunky, and might be able to pull of a level of nuttiness like my own! Ha! Plus, what a cutie! She could make me look darn good! Now it's YOUR turn! You can post your answers in the comments, or on your own blog! Be sure to add your link to the McLinkys, and don't forget to visit Mama M and The (Un)Experienced Mom to check out their answers! It would be so much fun to be on the radio :o) Meg Ryan is such a great actress, I love her. Yep, I can see Meg Ryan....pre-plastic surgery days of course. I didn't do 5QF today - I tried another Friday game. So many of them out there!! !